Notes: Based on the manga by Tajiri Satoshi. This review does not include the 20-minute "Pikachu: The Movie" short. As Ash, Misty, and Brock continue on their journey to the Johto League Championship, Spencer Hale finds clues about a group of Pokemon called "The Unknown". Unfortunately, Spencer disappears before he can reveal to those clues, leaving his daughter Molly without a mother or father. Molly accidentally locks the true power of the unknown, which use the dreams and imagination of people and makes them become a reality. The Unknown create a legendary Pokemon, Entei, which Molly takes in as a father figure. Molly tells Entei to get a mother because she hasn't had one for years. 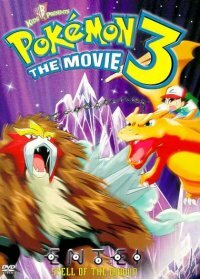 Entei finds Ash and the gang at the Pokemon center, kidnaps and hypnotizes Ash's mother, and forces her to become Molly's mother. Now Ash must fight his way through a once beautiful city, now covered with ice to save his mother from a child's imagination gone wild. This really isn't your typical Pokemon TV episode. Ash, normally an earnest Pokemon trainer, has become angry as his mother is taken away in front of his eyes. But he isn't the only with a change in personality or a role change. Team Rocket barely makes an appearance in this one, and when they do, it's to help Ash, Brock, and Misty save Ash's mom and Molly from her own imagination because without Ash, they have no reason to exist (Wow, their lives are full of meaning aren't they?). And Brock and Misty pretty much sit aside for a good portion of this movie as well. As for Molly, the new character, she is a selfish brat. She takes away Ash's mother without thinking about anyone but herself and refuses to give her back and end her little fantasies. There's very little to no opportunity to sympathize with her. While the plot is typical of an anime aimed at children, it's enjoyable to watch. Predictable yes, but I never really found myself bored, no matter how much I disliked the characters. It's something nice to watch when you really don't want the type of headaches that an anime like Serial Experiments Lain causes. I must say that seeing Charizard in action for the first time in a while made my day. The animation and artwork are far more refined in comparison to the poorly animated TV series, definitely above the average kiddie anime fare. For the most part, speed lines are gone; you can now see both Pokemon move simultaneously during a battle rather than watching one at a time. Background designs are lush and smoother looking. While the characters look the same, their design is also cleaned up and looks better, especially Entei who looks as if he lives in the Red Light District. The music is typical of the English dub. It's barely tolerable. I have yet to listen to the Japanese opening or ending themes, so I really can't comment on how good (or bad) they are. Even though the content of Pokemon is appropriate for all audiences, it is aimed distinctly at children. It's a rarity for someone of college age to even withstand watching this, much less actually enjoy it. Children will be quite happy to add this to their dosage of Pokemon anime and Pokemon cards, t-shirts, plush dolls, action figures, curry mix and just about anything that you can possibly imagine. I really didn't get what I expected from this movie. I expected something that would put me to sleep faster than a box of Nyquil tablets. In this case, it was the complete opposite. It was an entertaining, enjoyable show that kept me awake. And hearing that from someone who generally dislikes Pokemon, you know it has to be at least average. Recommended Audience: In terms of what's appropriate or not, Pokemon is appropriate for all ages, but for the most part only young children will find this enjoyable.